Bikes For Humanity PDX (B4HPDX) is a 501c3 non-profit bike shop and school. Our mission is to substantially increase public access to affordable and safe bicycles while empowering self-sufficiency in bicycle maintenance and commute. 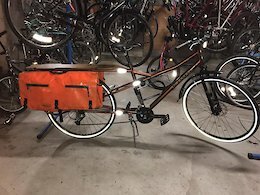 Kona UTE Cargo Bike, 20"
Kona UTE Cargo Bike, metallic orange color, 20" or Large frame. 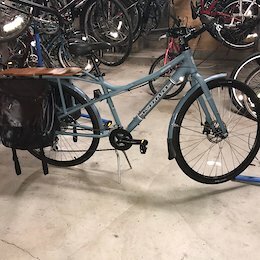 Bikes For Humanity PDX (B4HPDX) is a 501c3 non-profit bike shop and school. Our mission is to substantially increase public access to affordable and safe bicycles while empowering self-sufficiency in bicycle maintenance and commute. Proceeds from our sales go directly back into supporting our shop/school and expanding our mission. 2012 grey-blue Kona Minute road bike. 18" or Medium frame and 700c wheels. Bikes For Humanity PDX (B4HPDX) is a 501c3 non-profit bike shop and school. Our mission is to substantially increase public access to affordable and safe bicycles while empowering self-sufficiency in bicycle maintenance and commute. Proceeds from our sales go directly back into supporting our shop/school and expanding our mission. Collector's item - Schwinn Stingray, single-speed, small step-through frame with 20" wheels. Floral banana seat and original paint-job. Near mint condition. Bikes For Humanity PDX (B4HPDX) is a 501c3 non-profit bike shop and school. Our mission is to substantially increase public access to affordable and safe bicycles while empowering self-sufficiency in bicycle maintenance and commute. Proceeds from our sales go directly back into supporting our shop/school and expanding our mission. Make - Salsa. Model - Beargrease. Frame Size - M. Size - 18”. Rims - 26x4”, Surly Rolling Darryl. Serial - 22013050690093. Proceeds from this bike will go towards supporting our organization - a non-profit bike shop that offers affordable bikes and free bike education to the community.